As adults, do you feel as if you have lost your ability to imagine things? Do you feel you are a creative person? I find it interesting that if you ask a child if he/she is artistic, they will most likely say yes, unless this has already been squashed by an adult. Children can sit in their house’s play area and take marvelous adventures to outer space or become a superhero. You ask an adult the same question, they will likely say no. Two things in the last few years has changed my response to this question. Number one, I re-defined personally what my definition of creative is. I used to narrowly define creative as someone who is skilled in arts and crafts. Now, I define creative as someone who can solve problems in any area, or get their imagination to visualize a solution or think through something. One way I stretch my imagination is by reading a book or listening to a ball game on the radio. I am creative thinking about ways to teach customer service or basketball techniques to reach different audiences. The second is getting a “second chance” at childhood going through it with my boys. Recently, my boys and I were playing in the sandbox and we had left the tractor toys in the car. Ryan quickly gave me the assignment of being the “bulldozer”. I watched him play the “excavator” by scooping sand with his hands, so I transformed my hands into a bulldozer to do the job he gave me. Sawyer played the front end loader building up the sandpile. To the first point, I conducting a twitter/facebook poll asking the question whether people would rather watch baseball on TV or listen to it on the radio. Opinions were nearly split, but a slim majority did prefer listening to it on the radio. I enjoy visualizing the game in my head and the anticipation of waiting to hear what happens. I have many happy memories of doing work growing up while listening to the games on the radio with my dad and brothers. 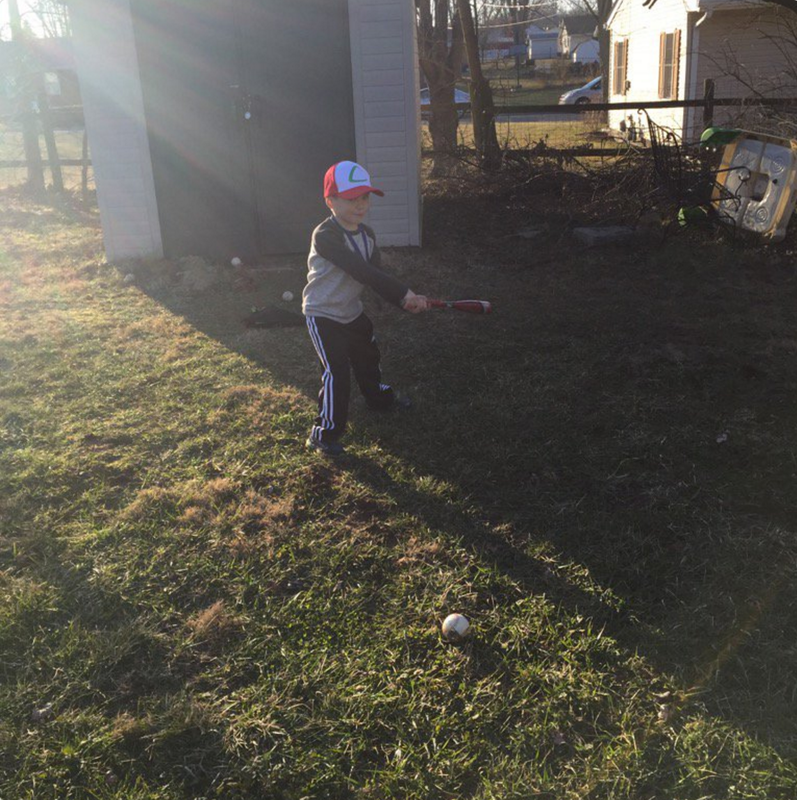 I was surprised that most of the kids I asked watching baseball on TV. In fact, they gave me a weird look for suggesting the radio. Generation gap strikes again. Should I be surprised? Kids are stimulated in different ways these days. They play hours of video games and watching others do things. There is such a decline in actual physical movement that it makes me sick to my stomach. I am not sure I am ready to re-define my definition for such sedentary activity. In addition, find a TV/radio, or internet program on a particular interest/hobby of yours, close your eyes, and listen to it. Your mind will soon be jumping with creativity. A problem, or something more? These boys teach and give me opportunities to teach lessons everyday. Rather than lecturing Sawyer or trying to pacify Ryan, memory of this podcast clicked in my brain. I calmed down Ryan by telling him I had an important lesson to teach him. He said, “Ok, Daddy”. We all know people who seem to rise to the challenge and take the chance to solve it. They don’t always succeed, and they are often criticized when they “fail”. If the critics really analyzed their feelings honestly, most of them try to avoid the moment and defer to others. The folks that often do succeed in coming up with solutions often become the leaders of the organization. Problems are a fact of life, you need people to step up and try to solve it! I believe one of my greatest values to my organization is that I do often deliver solutions. Becoming a “go-to” person increases your value and creates new opportunities for solutions. I don’t believe I always looking to deliver the solution, but as my self-confidence increased in adulthood, I have become more comfortable with the fear of failure with the chance to let the team succeed. I am willing to make the tough decision when others defer. During softball games, I want the ball hit to me, or I want to be up with two outs and the winning runs are on base. I want to take the last shot playing pickup or intramural basketball, not because I am the best player, but I like the pressure. Sometimes I fail, sometimes I succeed. I would rather take action than do nothing. I want my boys to look to solve issues. This will keep their attitudes positive, increase their self-reliance and resourcefulness, and avoid complaining. I would love to hear your stories “about taking the last shot”, regardless of whether you won or lost. Celebrate the problem solvers! Have a happy Monday! The Power of Outside Affirmation, Can We Serve In This Way? Over the past year, I have found my coaching heavily influenced by Joe Ehrmann‘s book Inside-Out Coaching: How Sports Can Transform Lives, Todd Gongwer‘s book Leading for God’s Sake: A Parable For Finding The Heart Of Leadership, and Jay Bilas‘s book Toughness: Developing True Strength On And Off The Court. Each of these books challenge the reader to think about WHY they are doing anything. As coaches, we have to think about having a WHY that transcends wins and losses. There is not a singular correct WHY, but coaches need to think about the reasons WHY they coach. Are these reasons for coaching transformational, or transactional (Joe Ehrmann’s work)? Is your coaching transforming and improving lives in a positive way, or only creating interactions interested in wins and the player doing what he/she is told? I have recently defined my WHY as: “To develop positive character through my platform by teaching the fundamentals that will translate to future endeavors”. As I was watching this video from the Cleveland FCA on Leading For God’s Sake, I started thinking about my WHY and how the so-called “little things” are so crucial to success. If I can assume the majority of coaches are using their platform to positively develop people, can coaches serve each other by providing outside affirmation to their players? I think all coaches realize from time to time, our players may begin to “tune us out”. As coaches, I think most people do not recognize the little things, the dirty work, the tough plays that lead to team success beyond the highlights of the shooter, the pitcher, the home run hitter, the touchdown scorer, the QB sacker. What power would there be if an opposing coach came up to one of your players as said, “You are the best screener we play against, you do a great job getting your shooters open”. “You always take the toughest offensive player and battle him for every point”. “You play unbelievably great help defense, you drawing three charges in that last game changed the momentum to your team”. “I heard you are in the top three academically of your class, you are the epitome of a student-athlete”. TALK ABOUT AFFIRMING THE RIGHT THINGS! This would only help and encourage players to continue to develop and enhance these little-recognized strengths. We would truly be serving the sport and young people by doing this. As coaches, we need all players to feel valued in their roles and in their strengths. In developing these coaching partnerships, I envision the following process: ask permission of your fellow coach; pull athlete aside in warmups for affirmation; ask fellow coach to do the same. If we could serve each other as coaches in this way, think about the power of transferring this to everyday life….we are quick to complain, but do we go above and beyond to thank the people that serve us? This could be the beginning of a whole revolution….professing our gratitude and respect, that’s my dream anyway. We all know people who already serve others with the compliments, and we all know those people who are quick to complain as well. -we are competing to win, can we risk building up a player before a game? -are we affirming the right things? Should both coaches be present for this affirmation? Tough choice….am I hurting my team’s chances of winning by boosting another team’s confidence? Can I trust the other coach to affirm my player, or do I need to be present? I have witnessed and read stories about this happening already, but usually only the stars receive it. Again, I believe the guidelines could be laid out and permission given before the warmups begin. I cannot wait to get back coaching on the sidelines to do this someday, I hope others think about this proposal and consider it. I would love to hear your thoughts. Have a great Monday! Road Trip! What do you immediately think about hearing those words? Do you remember a crazy trip that you don’t know how you survived? Did your car breakdown? Did you have a car accident? 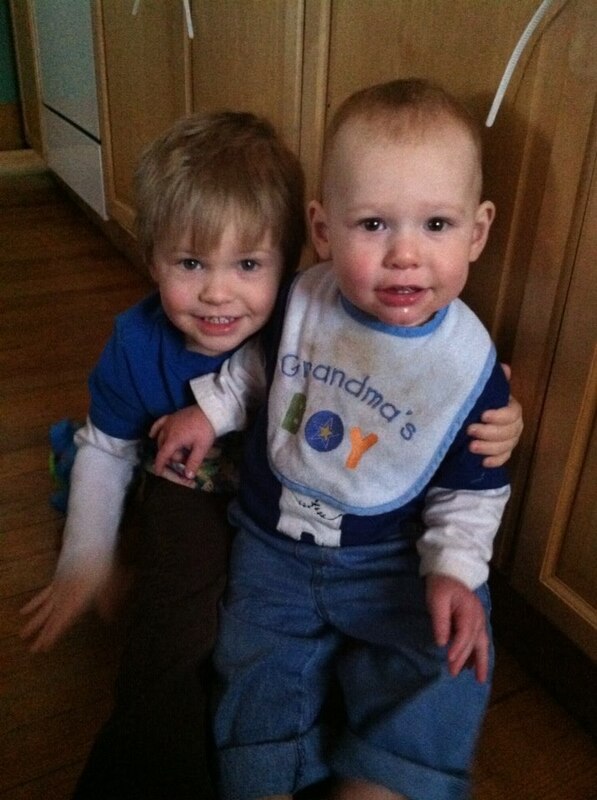 The day started out great, with Sawyer and Ryan playing together in the morning. I went to work, which was very emotional because I was saying to goodbye to a dozen Miami University student staff who were graduating that weekend. You work with these kids for 2-4 years, they become a big part of your work life and you get to see them develop on bridge from high school to young adulthood. I hope they go on to accomplish great things in the world. We left Friday afternoon on Mother’s Day weekend. Ryan (2.5 years old) is not too bad on the road at this point. He will sit in his car seat “reading” (feel good about this), pointing out every big rig and farm tractor he sees (funny, amazing, constant chatter, good), or watching a movie (it keeps him quiet for a long time, don’t like him watching this much TV though). Sawyer (8 months old) slept about half the trip, which was great. He rarely cried and sat some of the trip looking out the window. Our restroom/eating/diaper changing break was pretty uneventful. The toughest part of was listening to the Cleveland Indians lose, however, they are a 18-4 streak as of this writing…..
We rolled into Litchfield tired and ready for bed. That Saturday was packed with activity. Jen and I had separate friend plans, so we divided and conquered. We went to visit my grandmother, who is in her nineties and had a tough fall earlier that week, breaking her wrist and getting banging up. On our way to her house, our “check engine” light came on. We went in the house, dropped the boys off, and then I took the car to Auto Zone to get checked out. I was told it would be fine by putting in some fuel injector cleaner, but the light stayed on. 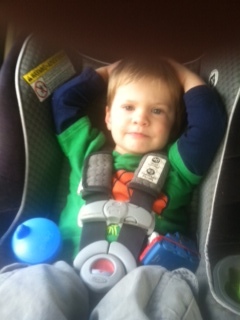 After a nice visit with Grandma…….Car re-shuffle…..Jen took my dad’s car, dad took my van, I took his van. Jen took Sawyer to the Eastside of Cleveland for a baby shower for her friend Derek McDowell and to spend the night with her mother. Ryan and I went back to my parents for his naptime. While Ryan took his nap, I went to the Buckeye Library to catch up on some email (parents don’t have the internet). I had the pleasure of running into Amanda Cook Hudak, a former classmate from high school. We had a nice chat and got to catch up on our families. It was great to see her. Afterwards, I went by the Buckeye High School baseball field and had the chance to talk to Randy Haury, my old basketball coach. Ryan and I went next door to a birthday party for my friend Bob Dieter’s FOUR kids (two sets of twins). There were six kids (including Ryan) who were running around having a great time. It was so neat to see! On Sunday morning, we went to morning breakfast with my dad’s side of the family. Grandma, Aunts, Uncles, and cousins were all there. The newest addition were two-month old twin girls. It was great to see them for the first time. To cap off the visit, there was a surprise 80th birthday party for my grandpap, with about 30 family members in attendance. How everyone kept this a secret so he was genuinely surprised is beyond me, but kodos to the tight lips. My grandpap is a remarkable man. He is one of the smartest, toughest, most caring men I have ever known. He can fix about anything, is so smart, and lives his life with integrity and purpose. He has been a role model throughout my life and I feel so thankful that my boys get to experience this as well. Oh….the trip home. It did not badly, except for the 80 miles of Sawyer crying. His screeches really amped my stress level and I had to tune it out and concentrate on the driving. Jen made great efforts to keep him calm, but he just was not happy. Big picture, we made in back safe and sound. Hope your mother’s day went well, and if you have any tips for keeping young children entertained for long car rides, I would love to hear it. Thanks for reading.